We are finally moving from the construction phase of building into the design phase! 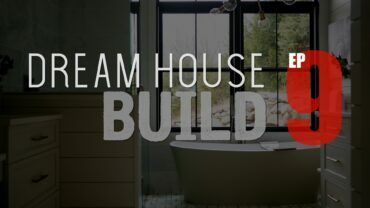 In this episode of the Dream House Build we take you through the initial design process of our dream kitchen, from picking out our appliances to designing our custom cabinetry, and we pour the back walkout patio which is destined to be another awesome space. We’ve been steadily chipping away at our kitchen design from day one. One of the starting points of any kitchen design is the appliance selection. 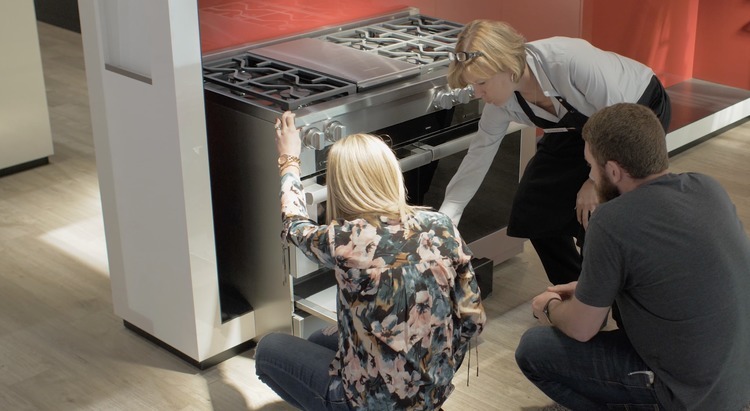 Knowing the appliance specs and the locations is required before you can start planning out the cabinets. We also needed to know this info for the plumber and electrician. When it came to appliances we didn’t want to skimp. 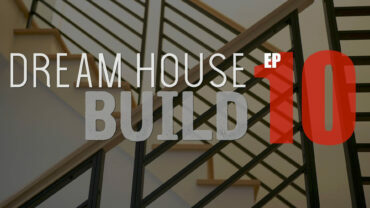 This is our dream house and Jamie’s dream kitchen so I wanted to be amazing. After all, managing this project and doing some of the work ourselves has allowed us to spend more money in other areas such as this. 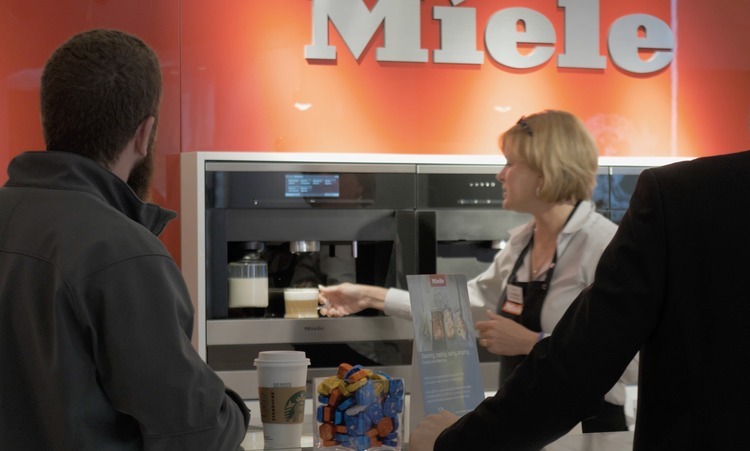 After doing a lot of research we settled on Miele. 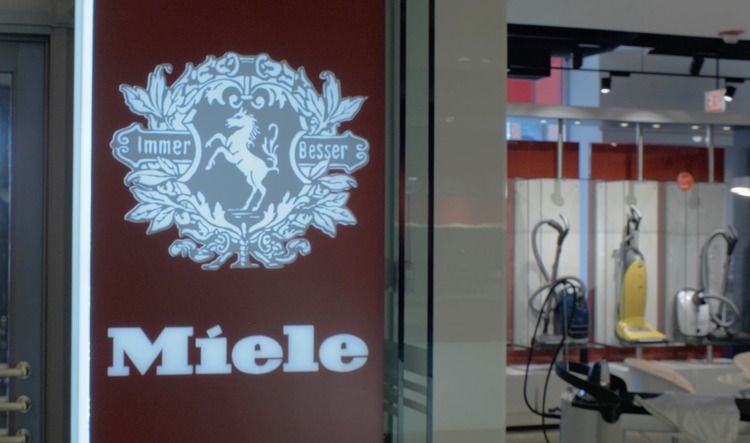 Miele is a family owned German brand of high end appliances that has been around since 1899. 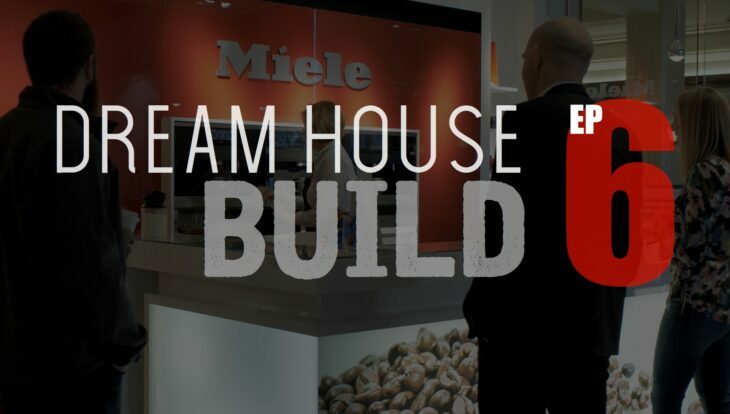 Unlike other companies, Miele designs, engineers and manufacturers all it’s products in a single facility, which I would imagine has something to do with the fact that they are one of the least repaired brands (das ist gut!). With such a big investment we wanted to take them for a test drive first. So we headed to Chicago to visit one of their experience centers. This is a showroom where you can get to see all of their products in action. 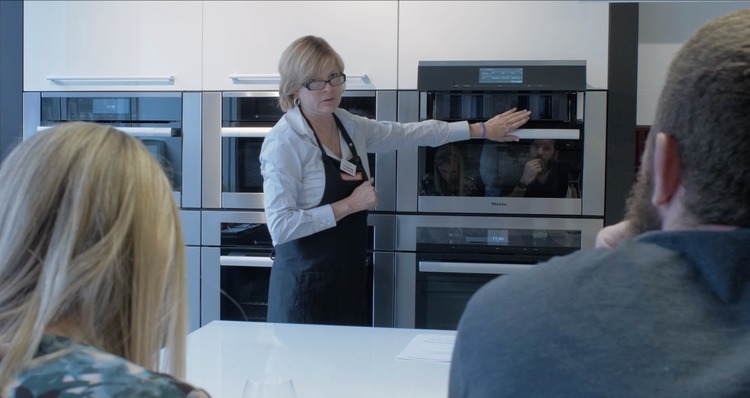 Disclosure: Some appliances will be provided by Miele in return for featuring their brand in this series. However, all the selections and opinions are 100% our own and we are so excited to have them as a partner! Support brands that support content creators, go check them out! 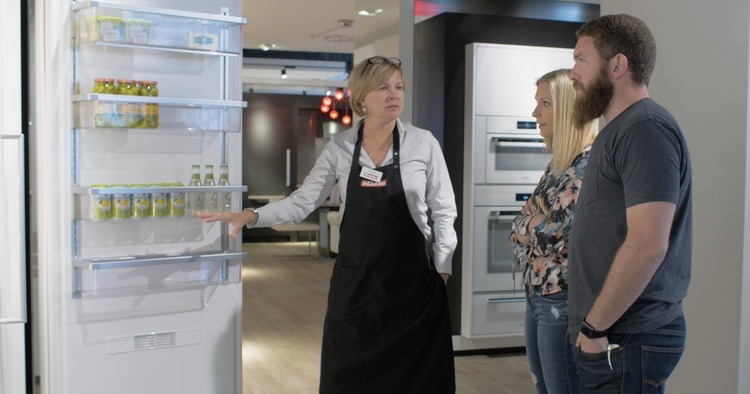 When it came to a refrigerator and freezer we wanted to go with something big so we decided on the 30″ Mastercool Refrigerator and an 18″ Mastercool Freezer. One of the great features about this setup is that they run off a duel compressor system, which means there will never be any air exchange between the refrigerator and freezer. It also ensures both the refrigerator and freezer are operating efficiently to keep our food nice and fresh. 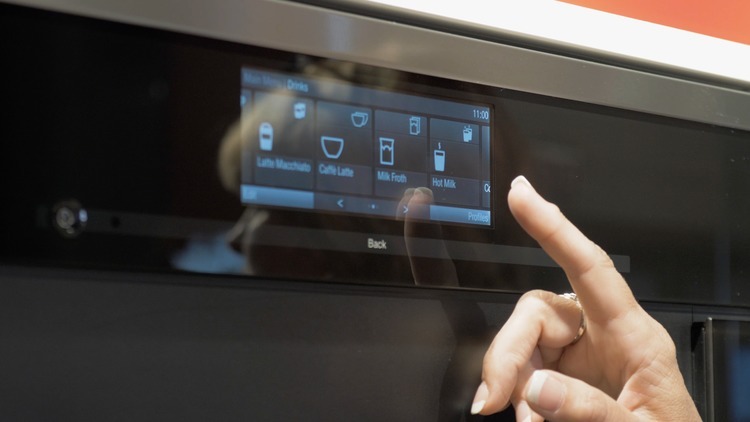 The SmartZone system in the refrigerator can be set to keep fruits, veggies, cheese, ect lasting longer. And with the RapidCool system you easily and quickly make those drinks extra cold. Another feature that really caught our eye was the LED lighting, is completely throughout the unit, making sure you can see all of it’s contents clearly. The range is the center of most kitchens, so when it came to deciding on this appliance we wanted to go big as well. We opted for the 48″ 6-burner ranger with griddle. 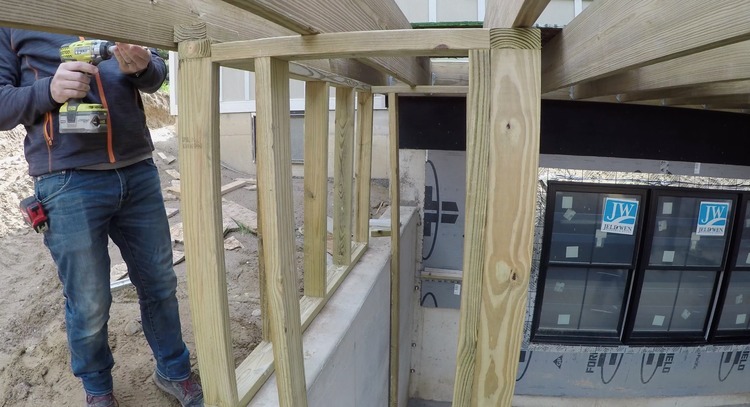 This one has two ovens, one smaller convection oven with a microwave feature that will be our main microwave and one larger oven with tons of features. Below the smaller oven is a warming drawer as well. 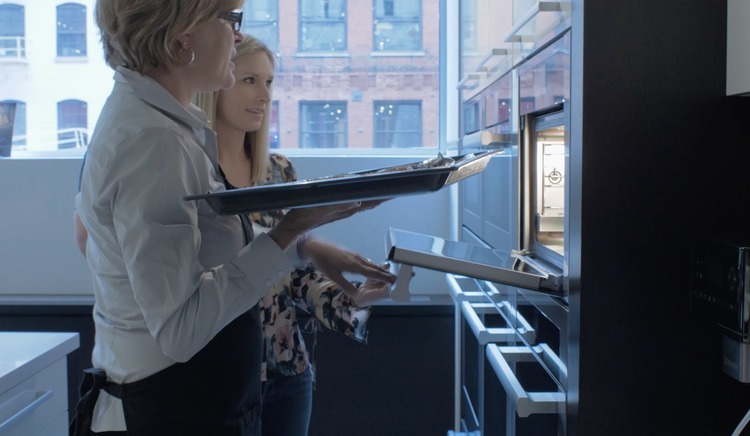 The oven is “dual fuel”, which means that the cooktop is fueled by gas for fast heating and the oven is powered with electricity for a more even and consistent heat. This oven also requires a water hook up for the moisture plus feature which is great when it comes to baking. 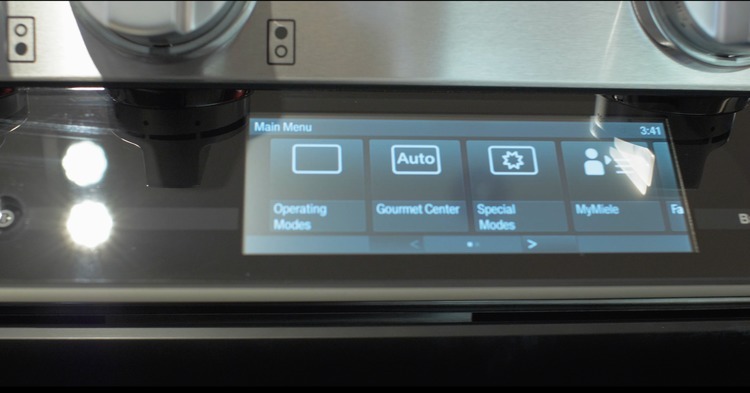 One of the features we really liked in this range, and many of the Miele cooking appliances, is the fact that they are so smart. Miele came out with a program called MasterChef which is basically like having a professional chef built in to the appliance. With loads of different operating modes from bake, gentle bake, convection bake, intensive, moisture plus, broil, maxi broil, roast, surround…. the list goes on, nevertheless, with all these options and controls it can be difficult to decide which to use. Well, with the MasterChef program you can simply select a dish and it tells you exactly how to cook it! Pretty amazing. Okay, so this may be one of my favorite appliances. Before doing some research on appliances I hadn’t even heard of a steam oven but, after having a meal at the experience center using one, we are both sold. The Combi-Steam oven is a steam oven that can act as a convection oven as well. A steam oven cooks food with, you guessed it, steam. Cooking with steam makes sure to lock in the moisture and nutrients, making for a tastier and healthier meal. You can steam vegetables, fish, meats, breads, and all kinds of stuff and with the Combi-Steam oven you can combine the steam cooking with convection for a nice crisp finish. Another great thing is that you can cook an entire meal in this thing at once, with no transfer of flavor. Like the range, the steam oven also has the MasterChef program. The folks at the experience center were nice enough to cook us lunch and show us how to use the steam oven and MasterChef program in the process. I must say, this feature is so cool. We cooked asparagus, eggs, potatoes, and salmon, all in the same oven. Once you enter in all the ingredients and how you want them cooked, the oven figures out the times, and tells you what to put in first, and in what type of pan, then an audible alert lets you know when it is time to add the next ingredient. Brilliant! Well done Miele. The salmon was incredibly tender and moist. While the convection gave the fish the perfect amount of crisp. When selecting the asparagus as an ingredient we were prompted with a scale of how well done we would like it cooked, from al dente to well done. And I must say, the asparagus was cooked exactly how we requested. Every morning in our house starts at the coffee maker. I love a good cup of coffee, ground fresh from whole bean. However, Jamie prefers to get her coffee as quickly as possible in the morning. With a built-in coffee maker we get the best of both worlds. 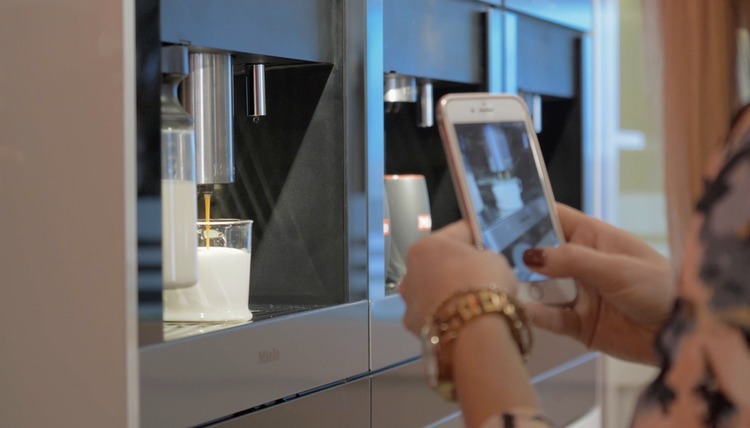 With this fine piece of machinery you can make a coffee, espresso, cappuccino, caffè latte, or a latte macchiato. Some of the features we like are the fact that you can brew two drinks at the same time and you can even create your own profile for your favorite drink settings. Another cool feature is that the spout senses the height of the cup and lowers down to the best height to give you the perfect crema. As you would expect, Miele makes an amazing dishwasher as well. We went with their mid level dishwasher which is still way nicer than anything we have ever had. One of the features that we love is the cutlery tray at the top. It even has a drop down center for larger serving spoons and what not. We also love the fact that it is amazingly quite. However, I think the coolest feature is that fact that the door automatically opens when the cycle is complete. Not only does that signal that it is done, but the fresh air allows the plastics to completely dry. Miele, you’ve gone and done it again! Last on the list, but certainly not least, the wine fridge. 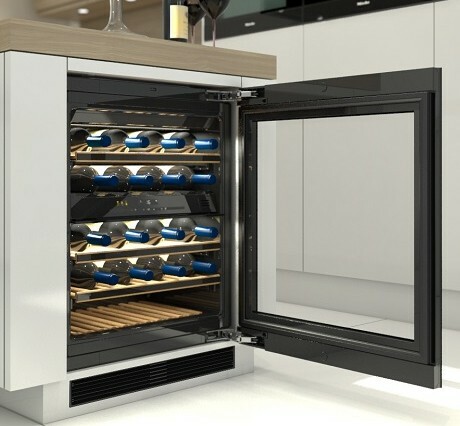 The FlexiFrame allows you to reconfigure the drawers to accommodate larger diameter bottles and the two zone system makes it perfect for store red wine and white wine beer at different temperatures. 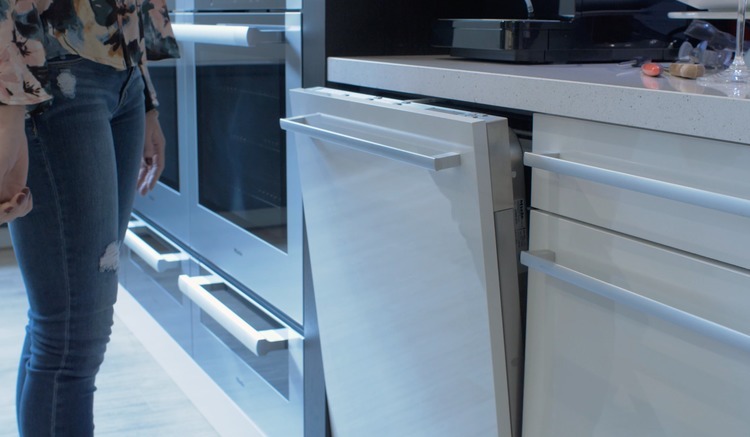 Oh and the fridge has a handless design, so you simply push the door gently to release the catch and open fully. Pretty neat. With all the appliances selected, and locations determined, we started to lay out the kitchen cabinet design. We priced out cabinets online at a few different companies. All of them offered free design services which we used to get a pretty good idea of the layout. While the prices were mostly in line, the cabinet designs and colors were somewhat limited. 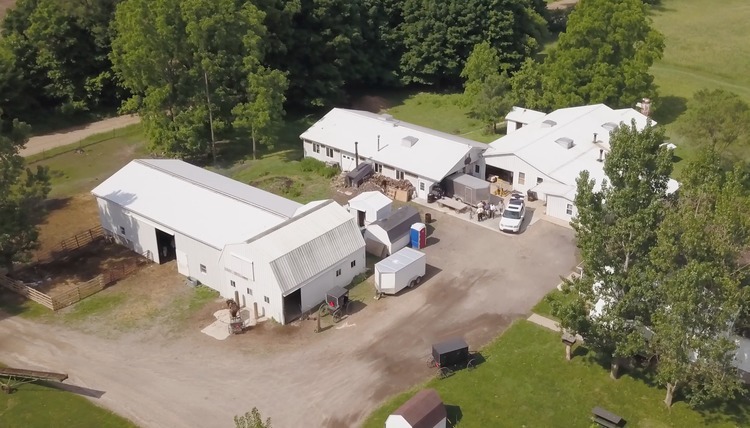 Finally, we decided to get a price from our local Amish cabinet maker and we were happy to find out that we could get fully custom cabinets for less than the online semi-custom cabinets. 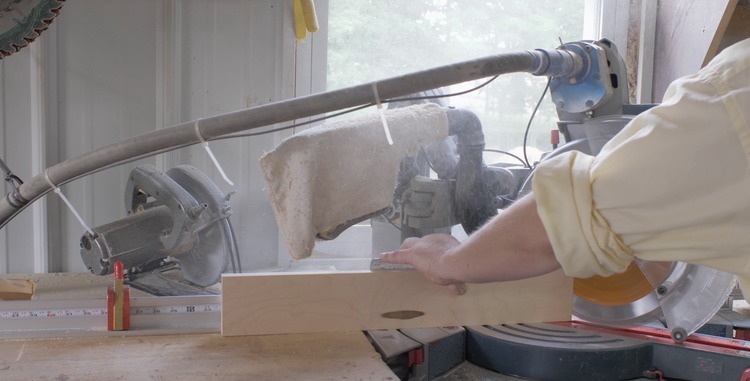 So we met the cabinet maker, Mark from Maple Lawn Wood Products in Homer, Michigan, and went over the design and what he could do to make it better. Then we sent him off with the appliance specs and he put together a hand drawing of the cabinets. 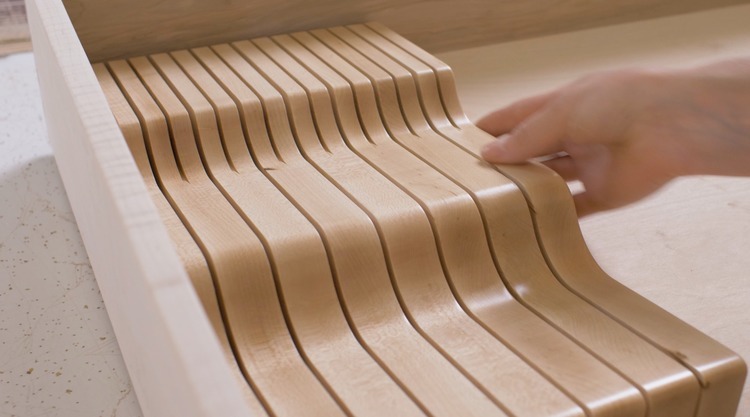 Once it was finalized, the cabinet manufacturing process began. When it comes to the Amish, you have to know that they do not use electricity. However, they are allowed to power their cabinet shop with a diesel generator. The diesel generator powers an air compressor for air tools and a motor that drives a shaft at about 1600rpm. 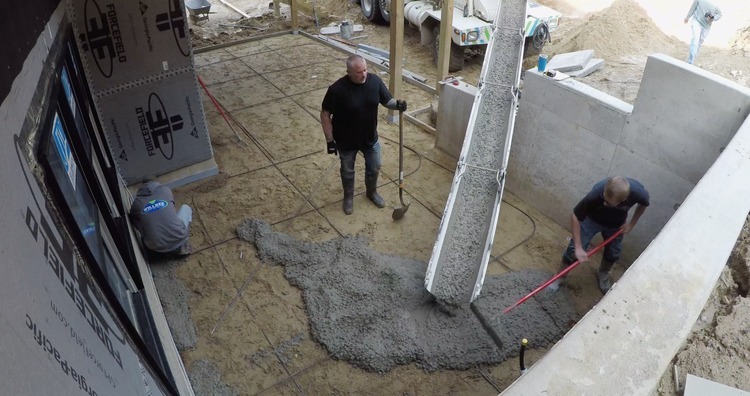 That shaft runs underground to most of the cutting tools (table saws, drill press, planer, jointer, drum sander, etc) which then gets geared to the appropriate rpm for that tool. A clutch is used to start and stop each machine. 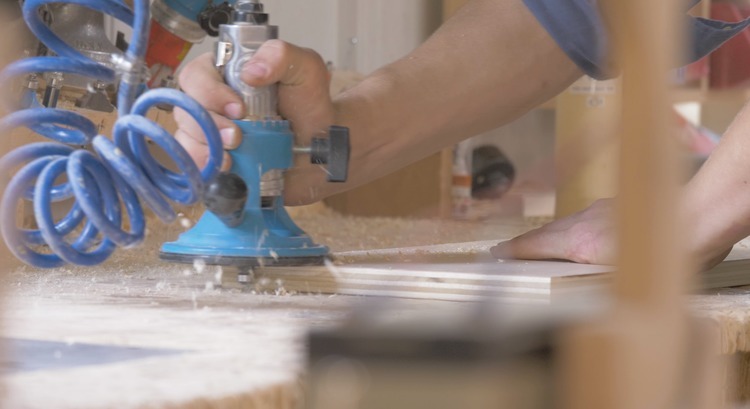 The miter saw, on the hand, is powered by its own small gas powered motor below it and connected to the saw with a long flex shaft. The cabinet makers outsource the drawers to another shop about 200 yards away where they make some amazing solid wood dovetail drawers. They also had some other cool stuff built by the Amish such as this knife block for the drawer. They call it “the wave”. And its not a day in Amish country unless you can hang out with the farm animals. 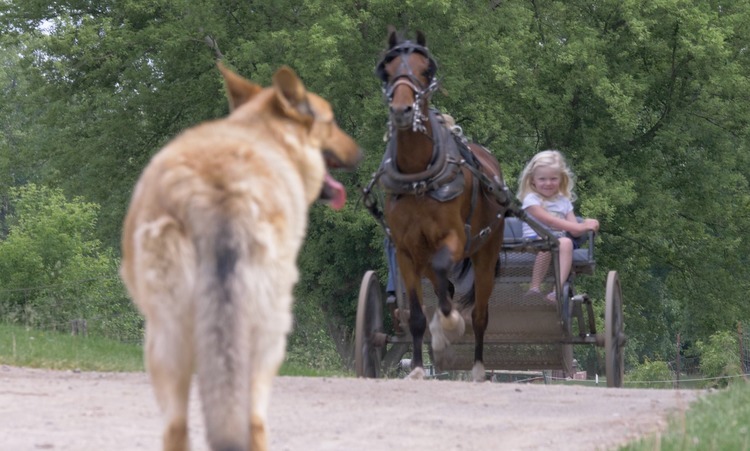 So Jamie and Madison got to see a newborn pony, goats, rabbits and even take a ride on the horse and buggy. 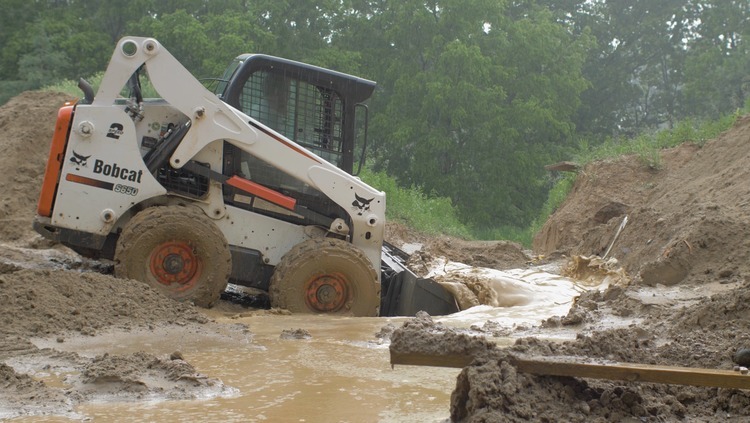 So after the retaining walls went in (in episode 5) we had a few days of rain in a row, and water almost backed up into the walkout basement. So we decided it was time to do some grading and pour the patio to pitch the water away from the house. 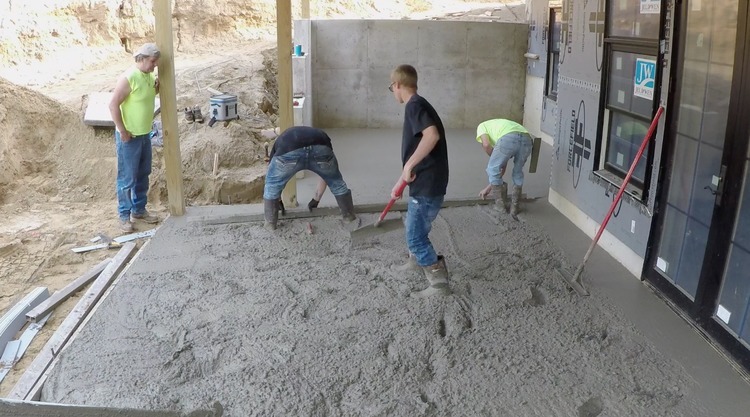 With the back patio graded it was time to pour the concrete. Since we had this patio trapped on three sides the contractor made sure to use a high quality vinyl expansion joint to make sure the slab has room to breathe. 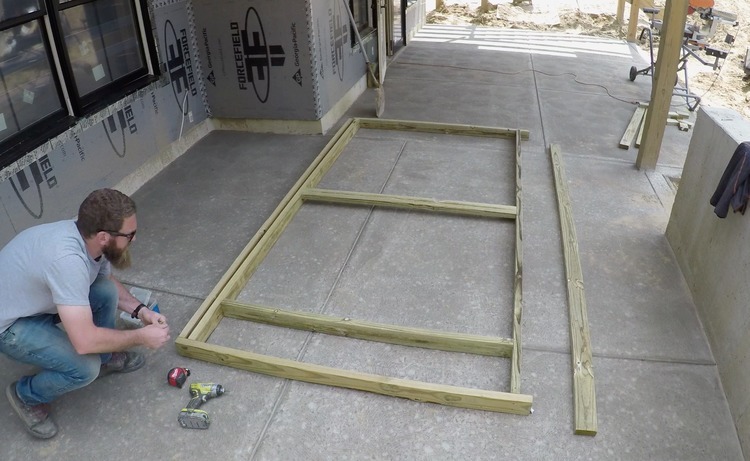 We also made sure to pitch the square in the “nook” out and towards the center, then pitch the other square away from the house. The deck above it will be waterproofed but any rain that drives in will all flow away from the house. The other reason for pouring the pad is that it is almost time to install the fireplaces and I needed to frame out the structure for it. We went with the Valor L2 linear fireplace with an outdoor conversion kit. 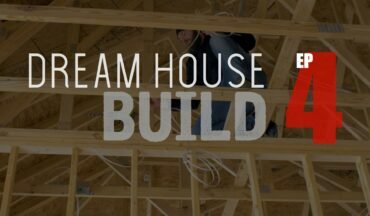 The specs specify the framing requirements which made framing it out fairly easy. 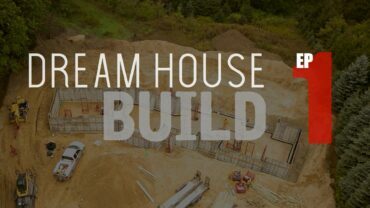 We are beyond excited with all the progress that is happening on the dream house and can’t wait to tackle the exterior. But let’s save that for episode 7….